This is an editorial of mine published in a local daily, The Wilkes Barre Times Leader on Sunday May 13, 2012. It is here in all its unedited glory. Every spring around Earth Day, my family and I join a group of my neighbors on a Saturday morning to perform “roadside cleanup” along a stretch of highway that runs near our community in Mountaintop. We’ve been doing this for roughly 15 years. Because we’re creatures of habit, I suspect that each of us gravitate towards one particular section of road that we call our own. I generally end up policing a roughly 200 yards section that runs along a fairly isolated part of the route. It’s a spot I suspect that people, knowing that they are unobserved, feel emboldened to toss all manner of garbage out of their vehicle windows and onto the surrounding landscape. Because of this, over the years I’ve noted several patterns involved in littering and dumping that make me somewhat cynical about my fellow-man. Some things I guess are just ingrained in you. I cannot imagine throwing anything out of a car window, or failing to comment negatively if a fellow occupant did. Yet judging from the volume of roadside debris that I encounter each year, there are many others among us that feel no such restraint. The piles of debris along our roadsides are sadly, too me, another indictment of this region’s people and their attitudes, in some ways as damning as those being handed down in our Federal courtrooms. Travel for instance, to State College, the Hershey area, or out to Western Pennsylvania and the amount of roadside trash vastly decreases or just disappears. . I honestly do not know whether this is because of more vigorous cleanup efforts occurring elsewhere in the state but I doubt it. People in those regions I think, just aren’t as callous about their surroundings as we are. Over the years I have decided that there are three main categories to categorize those that litter our roadsides. The first group is those who dispose of random objects tossed at the point on the drive when the food or beverage it contained is either consumed or no longer desired. In an unscientific sampling from this year’s cleanup I would say the most popular item to toss is a coffee cup, followed closely by empty beer cans, generally brands that are so cheap, I haven’t even heard of them( malt liquors cans are very common). You rarely see an empty Stella Artois, or a Magic Hat bottle alongside the road. Not to be a snob, but I think this says something sociologically about people who throw their crap out on our roads. I did find a lot of energy drinks this year, particularly the Monster brand of beverage so popular among the youths. This does not bode well for the future. A new item in the last several years is quarter full bottles of water and sport drinks. This also discourages me. It suggests that even people intelligent enough to be at least, mildly health, conscious, still think it’s OK to toss trash out of their car. They are at least intelligent enough to leave some liquid in the container so that it can be lobbed reliably from their car to the surrounding woodlands. I did find less this year of what was once a common phenomenon, the quart plastic iced tea bottle, filled with human urine. This was certainly a welcome development. Then there are the serial litterers. For many years, in one 100 foot stretch of my assigned roadside I would find perhaps 40 of the same size coffee cups, of varying stages of decay, bought at a vendor whose closest store is in Wilkes Barre. One could easily imagine this thoughtless individual finishing the beverage in roughly the same place, every day on their way to work, and then adding the empty cup to our local landscape. This year, there was no such pattern. It makes me wonder whether the closure of the nearby CertainTeed fiberglass plant recently, means that my coffee-drinking nemesis has lost their employment and no longer needs to travel that stretch of road. Perhaps the plant closure also explains the loss of the urine bombs, said to be the spoor of over-the-road truck drivers. The last and most egregious group of litterers is the dumpers, who think our roadside is an appropriate place for their unwanted household garbage. I suspect that one reason that this problem exists here is for lack of municipal dumps, which elsewhere in the country, give people a place, maintained by their taxes, to discard unwanted items. We commonly find plastic bags full of family detritus, along with old tires, furniture, and inoperable electronic devices. This year, we found the carcass of someone’s dog in a plastic bag sentimentally discarded among the Mc Donald’s bags and Power Aid bottles. At least some people have the courtesy to save their garbage until after our cleanup, placing their bags next to ours to await pickup. So for several days at least, our stretch of road will be fairly neat and tidy. The white garbage bags will be collected, leaving only the emerging greenery of spring. In about a week as I drive past, the glint of a fresh beer can (or a fresh case of beer cans) along the road will once again catch my eye. Thus is the cycle of life in Northeastern Pennsylvania. 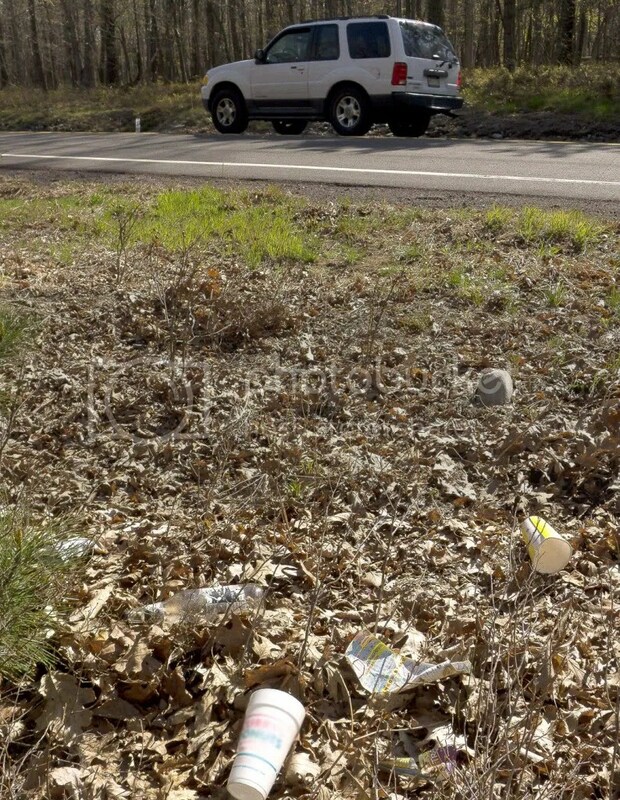 This entry was posted in Environment and tagged Eastern Forests, Henry F.Smith Jr, littering, Mountaintop, Pa, Panasonic LX5, Pennsylvania, Pennsylvania photography, roadside trash, Times Leader. Bookmark the permalink.